All it takes is a trigger of any level of intensity for the build up of dormant pain to activate and explode. Today, I am thankful to myself for finally getting to dig deep and truly recognize these emotions I’ve been keeping myself from feeling. Although I can barely open my eyes today, I can still see the beauty of the rawness that I am today. First post of 2019. Five-minute poetry that flowed through my brain while overlooking the ocean on the pier. This goes out to all the souls I’ve touched. Thank you for inviting me in. 1. Don’t be afraid to gamble your emotions. It’s okay to feel again. 3. Love is the language of the soul. No matter what being, love is universal. 4. Embrace our unique roots. Remember them as we embark on new journeys. 5. The human body is a remarkable machine. Celebrate its victories and flaws. 6. Art is not dead. In fact, it’s thriving more than ever, especially in Los Angeles. 7. Community can be a strong force. Don’t forget the power of sharing our blessings. 8. Even fire and ice can be together harmoniously. 9. People are in our lives for a reason. Some are only here for a season. 10. Adult Halloween is underrated. Let loose once in a while! 11. No matter what situation we’re in, give more than take. 12. It’s the inside riches, not outside ones, that produce true happiness. We all experience it on both sides. With 2017 coming to a close, I definitely had my share of disappointments this year. But through this process, I’ve learned that I believe in second chances. Sometimes, we make mistakes from blind judgment and narrow mindedness. Our reactions and takeaways differ depending on the severity of consequences. Looking back, my greatest spurts of growth all happened upon making mistakes, especially ones involving disappointment. No matter what the outcome was, I thank all who have come and gone this year. I thank you all for affecting my life, for better or worse. I’ve learned a lot and shall continue moving forward. If we both believe in second chances, then perhaps our lives will intertwine in the future. I have expended much of myself without actively replenishing. My inner being is chaotically housing a frantic shell and crinkled soul. As much as I like to be with people, a time of solitude is necessary for me to develop some introspection and to fill myself back with self-love. So for now, I am unavailable. It’s tough to remain positive and grateful in dark times, but thanks to the nature of this blog, I am forced to reflect on the good as well. Thanks for keeping me afloat, dear blog. Also, thanks, random photo grid of people in my camera roll, for helping me see my end goals and motivating me to push forward. Cheers to future simple words of gratitude. spellbound by the songs of Them. I only want equilibrium for myself. I was recently introduced to the dynamic and mesmerizing world of fine art, thanks to a new friend who is quite active within the Los Angeles art community. 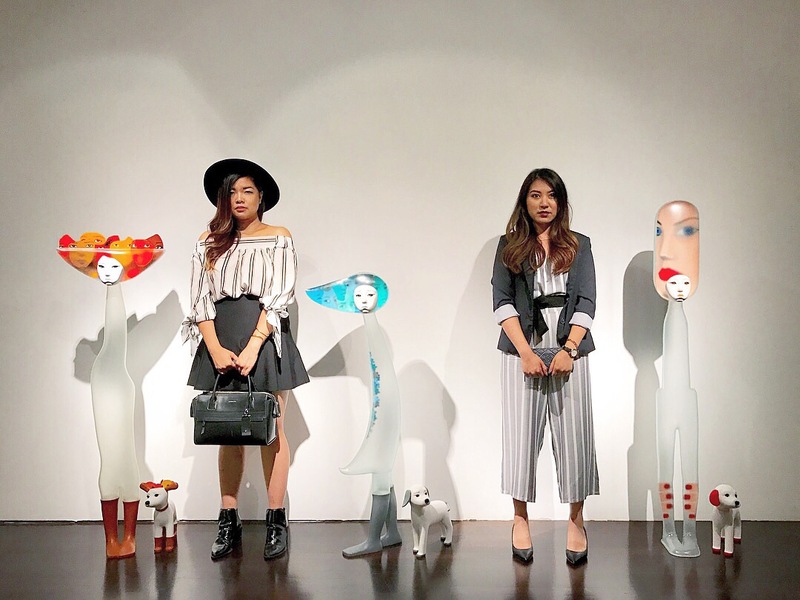 While supporting him at his solo art show at the Pacific Design Center in West Hollywood, I stumbled upon the art exhibit of Yu JinYoung, who’s sculptures represent the social disparities we are often exposed to throughout our lives. This series is called “Myself & Them.” The heavy feeling of responding to the outside world while taking care of our own inner world really resonated within me, as I questioned my life choices and potential trajectories, as well as my own influence throughout my social circle. Oh, the struggles of dealing with the words of others while treasuring the dreams of my inner being, and balancing life. Being human sure isn’t easy, but it’s a gift we must cherish and nurture to the best of our abilities. Thanks, Yu JinYoung, for welcoming me into your exhibition and allowing me to bond with your amazing pieces. Through my experience with your art, I am learning how to love myself in this world full of social disparities that continue to challenge my personal values. Also, a thank you to my new friend, for introducing me to his fascinating world. Cheers. It is commonly said that getting started is the hardest part. So we bit the bullet and dove in. What’s next? Is it smooth sail from here? Hell no. The hardest part is getting started, but that doesn’t mean that things become easy once we begin. What we experience next is resistance. We’ve made changes, we’re trying something new. We’re leaving our comfort zone. The feelings of discomfort and anxiety are our ways of resisting the new obstacles in our lives. It doesn’t necessarily mean that we’re hurting ourselves. It’s just us experiencing growing pains. How fitting it was to have read a very relevant passage of The Alchemist when I had these thoughts. I hope that this is a reminder to everyone that we shouldn’t give up too soon. So thank you, The Alchemist, for helping me push through my obstacles, and for helping me articulate my thoughts! This is one of my favorite quotes of all time. Our world is so complex, partially because it is created by our unique perceptions of realities. The concept of “good versus bad” was a recurring theme in conversations I’ve had throughout this year so far, but at the end of the day, who gets to determine what is good or bad on our behalf except for ourselves? Let us respect individualism. There is no right or wrong way of living our lives; that is entirely up to us to perceive and control. The important thing is to live according to our personal values. Let us pause and think for a moment before judging the server who has given us subpar service, or a person who is known for their promiscuous ways. Everyone has their own life stories. Let us utilize our thoughts to judge less, respect more. Recognize that even if someone is doing something we don’t necessarily agree with, it doesn’t mean that they’re doing something bad. Today, I thank the people and interactions that have come and gone pertaining to this theme. These conversations have definitely challenged my way of thinking and life decisions. I hope to continue growing, and intend to hold this quote to heart when I hesitate with obstacles. One last thing: I think I’m still a good girl. Today, I attended a funeral, celebrated birthdays, and started to welcome the next zodiac year. Honoring the different milestones today brought me back to the much-needed view of the big picture. I’ve been overthinking about quite minuscule matters lately, so this day full of events was a reminder that we mustn’t always be caught in the details. Ironically, that’s losing focus. If it won’t matter in a year, then there’s not much of a point in thinking so hard. Let the thoughts pass quickly, and move forward. If it will matter, then take action. Today, I thank the coincidences and timing of events, for reminding me to not lose myself in the process of overthinking. Sometimes the answers are simply found at different focal lengths, so we must accommodate various focuses and look at all distances. Cheers. As an aside, it was definitely odd experiencing such different atmospheres and crowds throughout the day. Also reminds me of how small I am, and how in the end, I don’t matter to the universe.